How to get luxury, first-class bedding… for free? Did you know that if you fly first class, there are nice pillows and slippers and blankets? Especially if you fly British Airways, United Airlines and American Airlines. How do we know this? Because first class passengers on these flights have made a habit of taking their in-flight bedding home with them. So basically, if you fly first class once, you could get yourself some luxury airline bedding! Only if you’re willing to steal it though. How nice could it possibly be, you ask? Really, really nice. Nice enough to be worth $79 online. Yep. That’s the price of the first class official duvet from Saks Fifth Avenue that United Airlines has started making available for purchase online – after sending a memo to it’s flight attendants last year urging them to make sure the luxury bedding wasn’t taken off the plane. “To help ensure we are able to continue offering these high-quality products, it’s important to remind customers that these items remain on board the aircraft after every flight,” the memo said, according to travel site Live and Let Fly. 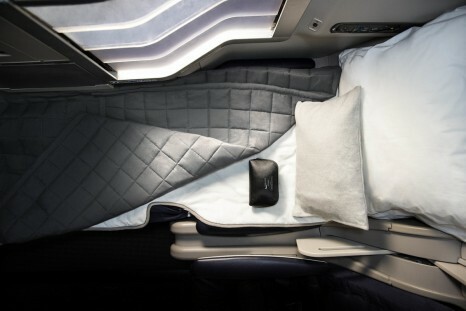 Other first class bedding is increasingly disappearing from American Airlines and British Airways, who provide bedding from luxury brands Casper and White Co respectively. “It is a huge problem right now,” American Airlines director of premium services and customer experience strategy Nick Richards told Skift. American Airlines offering from Casper includes mattress pads, pillows, duvet and the cutest lil’ slippers. Just look at it! Obviously, sneaky first class passengers have been hiding these away in their bags ever since American Airlines partnered with Casper last year. But can you really blame them? British Airways have been experiencing a similar problem after introducing their White Co bedding, which includes a “super-soft woven blanket” and a “bespoke, luxuriously soft large pillow” for their premium long-haul fliers. However, this $745 million investment in the passenger experience has perhaps gone a little too well – with travellers loving them enough to take them from the planes. “People go, ‘Oh my god, this White Company bedding is lovely’ and they take it off the plane with them, which they’re not really meant to do,” Harry Zalk, a commercial director in the British Airways and White Co partnership, told Skift. Thieving first class passengers can, in this case, equal millions of dollars in losses – and United Airlines has begun making sure their passengers know it. “We hope you enjoyed the pillows, blankets and bedding during your flight. Please be sure you leave these items on board as you exit the aircraft,” a new departure script reads on-board.